The first Vet Corps program ever funded by the Corporation for National and Community Service (CNCS) began in 2009 through a partnership between the Washington Commission and the Washington Department of Veterans Affairs. The goal was “to engage veterans in AmeriCorps national service positions that would help them make a positive difference in communities across the state and aid in their reintegration into the community after military service.” Since 2009, Vet Corps has become a nationwide focus for CNCS, leading up to this year’s National Veteran Corps recognition day. Recruited more than 27,000 veterans to serve as AmeriCorps and Senior Corps members across 200 American communities, helping other veterans and military families access benefits and services; obtain job training and conduct job searches; provide safe and affordable housing; and mentor and tutor children of service members. ​More than 500 Senior Corps projects and 8,000 Senior Corps volunteers serve at Veterans Affairs facilities each year. ​AmeriCorps NCCC provided service to more than 76,000 veterans through more than 101,000 hours of project service, contributing to energy conservation, environmental stewardship and conservation, urban and rural development, infrastructure improvement and response to natural and other disasters. Volunteer West Virginia staff, West Virginia CNCS staff, AmeriCorps Director Bill Basl, AmeriCorps VCOT members, and military personnel met this summer in Charleston to discuss Veteran and Military issues in West Virginia. Photo by Volunteer West Virginia. Vet Corps also has a great impact here in West Virginia. Volunteer West Virginia leveraged more than $365,000 of its annual budget to address the needs of veterans and military families with a focus on transitioning homeless veterans into sustainable housing and employment. Volunteer West Virginia funded programs such as the AmeriCorps VISTA Veterans Community Outreach Team (VCOT). AmeriCorps State programs, such as WVCHAD and LifeBridge, served 4,318 veterans and military families throughout the state in 2014. Fourteen AmeriCorps state members are veterans who served 1,177 veterans, 185 military families and 1,617 active duty military personnel in 2014 by identifying and developing links to veteran services, teaching job readiness and financial literacy skills and establishing peer support networks. 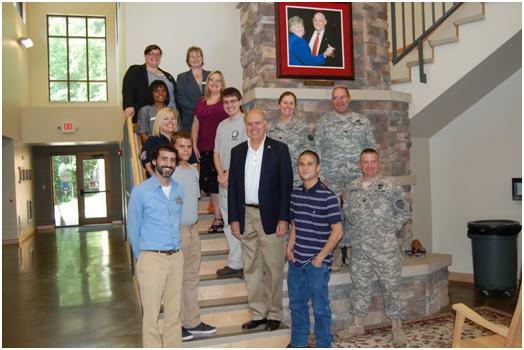 During the summer of 2014, 270 military children were served by VCOT members who assisted with summer activities during military youth camps as part of their VISTA service with the National Guard Family programs in Charleston and Martinsburg. More than 1,800 elderly and disabled veterans and their families received free rides to and from medical appointments because of a partnership between In Touch and Concerned Inc. of Morgantown, developed by VCOT members. 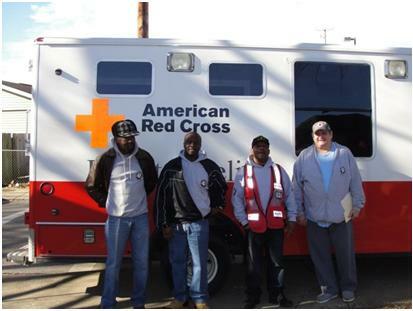 LifeBridge Vet Corps members preparing to be deployed with the American Red Cross. Photo by Volunteer West Virginia. National Service is stepping up to meet this growing need of military personnel transitioning to civilian life. By providing veterans the opportunity to focus on helping others through AmeriCorps, thousands of veterans are successfully transitioning from a life of military service to a life of community service. The possibilities are endless! If you would like to learn more about how you can transition from military service to National Service, what National Service options are available to you or your organization, or to join one of AmeriCorps’ programs, visit the Corporation’s website at www.nationalservice.gov. Together we can strengthen communities through National Service!